Formed in August 2003 by reedman Paul VornHagen and conguero Alberto Nacif, this exciting Cuban jazz combo has released five critically acclaimed CDs of mostly original compositions that have been featured on all the major jazz public radio stations throughout the U.S. Winner of the 2005,2007 and 2013 Detroit Music Awards for Best Jazz Recording and Best World Music Band, this combo has performed at all the major Michigan jazz/music festivals including Detroit, Michigan, Lansing, Birmingham, Raisin River, Great Lakes Folk, Blissfest, Wheatland Dance and Ann Arbor to name a few. The title cut of their 2009 Cd was used as a soundtrack for the USA Network TV show, Burn Notice. 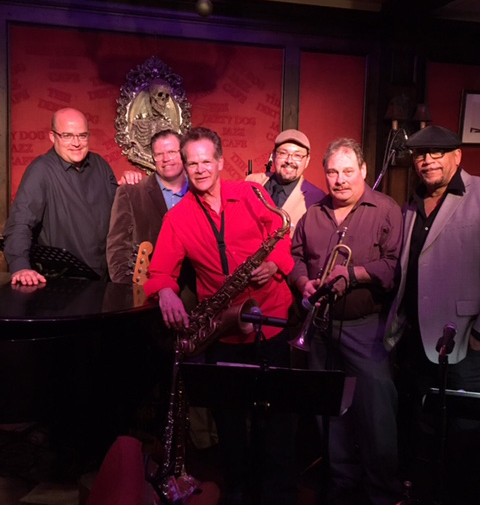 In September 2017, the band released their 5th Cd, “El Nido-The Nest” which is being featured on many National Public Radio (NPR) programs including the top rated, JAZZ AFTER HOURS and Miami, Florida’s WDNA–a mecca for latin jazz recordings. All band members have won or been nominated for individual Detroit Music Awards as well teach at U of Michigan, Washtenaw CC, Jazz Camps and music studios. For the past 8 years, Tumbao Bravo has been presenting a library program called “The Rhythms of Cuba” at numerous libraries throughout southeastern Michigan and the San Francisco Bay area. Other music performance venues include Chicago, Toledo, OH, Windsor, CAN and Oklahoma. Our newest member is the well-known Detroit conga/bongo player, Gregory “Greco” Freeman, who has a long list of collaborations with top salsa bands and jazz artists.